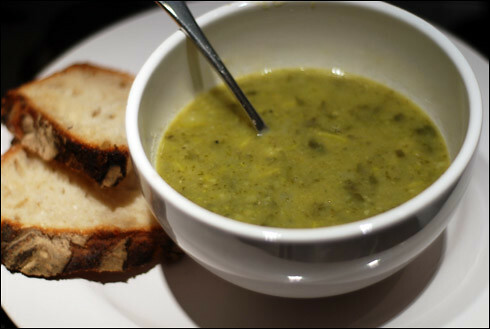 Another recipe inspired by the Covent Garden Soup Co, this is a new favourite of mine. It is cheap to make, extremely delicious and keeps well too - I made enough for 8, which with just two of us in the flat kept fine for the remaining three days after we first ate it. Not just cheap and easy; it is super healthy and vegan to boot! And you see that bread sitting alongside it in the photo below? It's from Franco Manca in Chiswick. They make exceedingly good pizzas, and their sourdough (which they sell on Saturdays) is a little slice of heaven. One of the best sourdough breads I've eaten too, which is high praise indeed coming from a self-confessed sourdough addict. Peel, chop and boil the potato for 20 minutes, or until soft. While the potato is cooking, chop the onion and courgette and fry in a large, heavy bottomed pan over a medium heat until soft. Crush in the garlic cloves and fry for a further minute. Drain the flageolet beans and add to the pan along with the peas. Chop the spinach and basil and stir in. Once the spinach has begun to wilt, add the stock and simmer gently. Once this is done, the potato should be ready - drain and mash the potato, then stir into your soup. At this point, divide the soup between two pans or bowls. I like to blend half of it to add a creaminess to the soup itself, but I also like to retain some of the vegetable texture to chew on. Once you've blended half the soup, return to your large pan and mix both halves back together. Finally, add the orzo pasta. I found it took about an hour to cook properly - 50 minutes longer than the directions if you were to boil it. Stir occasionally to prevent it from sticking to the bottom, then serve with a couple of slices of delicious fresh bread.